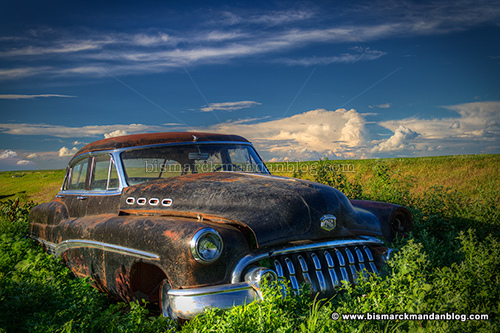 This is a 1950 Buick Roadmaster, a car known for its Straight Eight, or Fireball Eight, inline eight-cylinder engine. I remember hearing about this engine in the movie Rain Man, when Raymond mentions it. This one sits beside a rural road, its glory days long past. This car is noteworthy because Buick put those ports on the side of the car to denote power, or something. It’s that distinguishing feature which helps identify the year of the car, because the placement varied from year to year. I’m not really into classic cars, as nostalgic as I am about other things. I like technology, and hot rods really don’t have it. I can appreciate ’em, don’t get me wrong. They’re especially nice to photograph, especially on a nice, sunny day under a North Dakota prairie sky!